Ok, this is just a general blog post, not focusing on anything to do with online gaming or reviews. Throughout the years – and I do mean years – I have been visiting coffee shops and during that time, technology has had an impact on the places I visit and what I actually do to pass the time there. So I thought I would bore you all stupid and blog about it…enjoy! There was a time, when I was younger that I had a real phobia about going outside. When I say real, I mean that it wasn’t just me being anti-socialable or having a dislike of meeting people, I mean that it was real and I had to have support to get over it. One of the ‘tasks’ I had to complete was to venture out, by myself and have a coffee somewhere. This I can safely say was probably the starting point of my enjoyment of coffee shops but over the time I have been visiting them, things have certainly changed. In the beginning – Within primary school teaching you have some time for planning, preparation and assessment. Commonly known as PPA time, this was arranged in a different forms in different schools. Initially this time allowed me to work from home one day a fortnight. Starting to plan at 6:30am I would work until lunchtime and then make myself take a walk to the local shopping centre for a mocha and a cheese and salad baguette! My first shop was BBs Coffee and Muffins!. It was a nice place to have coffee in even though it did have a children’s play area in the back! I would sit never the door (just in case I freaked out and had to leave) and eat and drink people watching in order to take my mind off the simmering panic attack. It was a very good starting point for me, but as soon as the last sip of mocha had been consumed I was out of there – task was complete. Next shop alongIt was after some time that I found out that sadly BBs was closing. It was subsequently replaced by Burger King and finally Game is there. However, a new coffee shop opened next door…and so began my obsession with Starbucks! I’ve gone through many drinks at Starbucks – to start with it was a Mocha – which would actually make me feel ill afterwards (later moving to soya milk sorted this!) through Earl Grey tea and wet cappuccinos to the eventual Soya wet latte that I drink today. Food has moved through regular cheese sandwiches, fruit toast, rocky roads, very berry swirls (no longer available – that was a sad day) to cinnamon swirls. Nowadays I tend just to drink coffee but the food as always been nice and I am sometimes tempted by a cheese and marmite panini if my visit coincides with lunch. 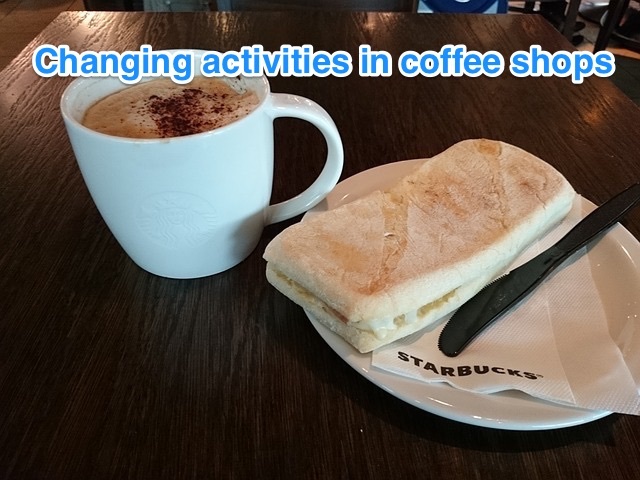 Changing activities-My visits to BBs would always be accompanied with people watching, but as I became more confident leaving the house, I started to spend more time in the coffee shops. In order to to this and not look weird, I needed an activity. There was no wifi in those days, so a humble book would be my first choice – often with earphones in without music so I would not be disturbed. Later this progressed to visiting WHSmiths for a computer or photoshop magazine to flick through and actually read – I’m still gradually getting rid – well recycling – numerous magazines from home. I remember once I actually managed to tweet once by using my data package on my Nokia phone! I was concerned all the way home about how much it had cost me! I got my first Starbucks card so I could start to use the wifi within the store and then it was necessary to bring a device with me – initially just my phone, but later a laptop then my ipad and now my macbook. I remember getting stares sometimes when I used to get my laptop out – guess i was a pioneer! Now I am quite set in my ways – soya wet latte (venti of course, anything smaller seems like just a mouthful) and weekend mornings are the best. Macbook out, sat in my favourite seat (wish I could reserve it!) and people watch out the front windows and write my blog posts. I sometimes look back on how nervous I was about sitting in BBs and often amaze myself at the difference. I guess coffee shops have probably changed how I interact with the world – without them I might still be sat in my house all day. Technology has changed what I can do while enjoying the environment here (because I am sat typing this ins Starbucks) and I can only wonder what I will be doing here in ten or twenty years time! Guess that’s the one of the wonders of technology – we never know. Almost enough for a mage shop!